A Monthly Record of Zoistic Science and Intelligence / A Monthly Record of Zoistic Science and Intelligence, Embodying Physiology, Phrenology, Psychology, Spiritualism, Philosophy, the Laws of Health and Sociology: An Education and Family Magazine. London, England, and in 1878, Glasgow, Scotland. Editor: James Burns. 1/1, April 1867-12/133-4, May-June 1878. Illustrated. Burns (1835-1894) was a Scottish vegetarian psysiognomist and phrenologist who in 1863 started a Spiritual Institute (with lending library and lecture hall) in Camberwell and then on Southampton Row in Bloomsbury that acted as a mediums' registry (he sponsored Emma Hardinge [Britten] on her first English tour), and spread a populist species of early progressive spiritualism. He was a showman. He published Gerald Massey's first book (and then reviewed it in Human Nature to ensure its success). Apparently he traveled, as the secretary of "Professor" Fowler, in spreading the word on spiritualism, and on one such trip in 1865 was instrumental in starting the Spiritualist National Church, Liverpool. "A Brief History of Spiritualism in Liverpool, as Recounted in the Roll Book of the Spiritualist National Church, Liverpool," online http://web.ukonline.co.uk/rminjoot/History.htm. While Human Nature was devoted to the more thoughtful examination of spiritualism and related topics, Burns' Medium and Daybreak was more colorful and topical and vastly more popular. It was in the pages of Human Nature that Anna Blackwell first published her ideas on reincarnation and William Stainton Moses (M.A. Oxon.) 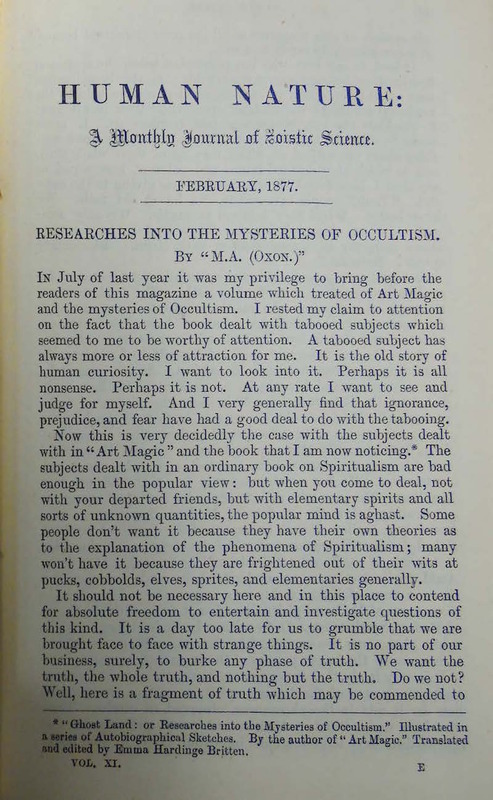 published his thoughtful explorations of spiritualism and nascent occultism. Columbia University; LOC; NY Academy of Medicine; Harvard University; University of Pennsylvania; University of Wisconsin; Amsterdamse Universiteit; Cambdrige University; National Library of Scotland; University of Manchester; University of Iowa.